Half of all parents now say they prefer a blended learning environment for their children. Districts are embracing new classroom models and reporting positive academic impacts. While more than 70% of teachers say their classroom format is traditional, just over half of all students agree. 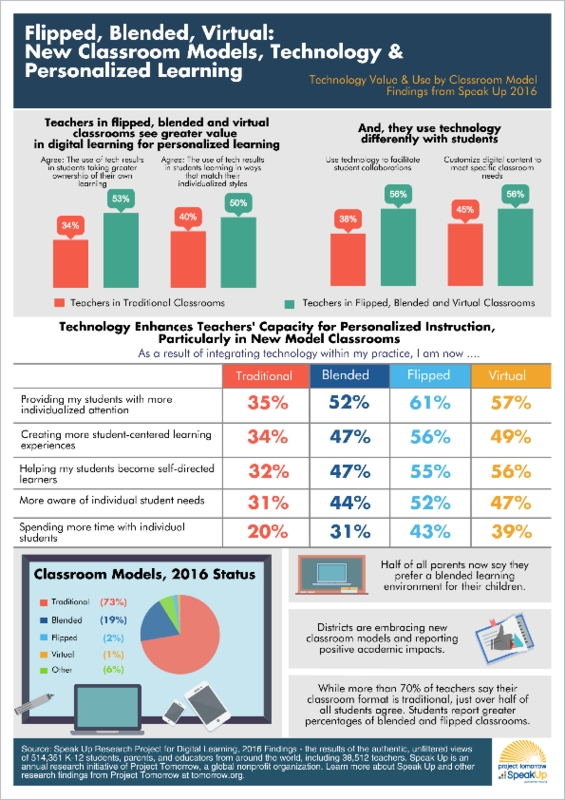 Students report greater percentages of blended and flipped classrooms. Source: Speak Up Research Project for Digital Learning, 2016 Findings - the results of the authentic, unfiltered views of 514,351 K-12 students, parents, and educators from around the world, including 38,512 teachers. Speak Up is an annual research initiative of Project Tomorrow, a global nonprofit organization. Learn more about Speak Up and other research findings from Project Tomorrow at tomorrow.org.